and traces its origin to the chanting of vedic hymns and mantras. For the past five centuries Dhrupad has mainly thrived under the patronage of Mughal and Rajput kings. The picture below shows Dhrupad singers Zakiruddin Khan, Allabande Khan, Ziauddin Khan and Nasiruddin Khan (clockwise from top left) the foremost Dhrupad singers in the beginning of the twentieth century. 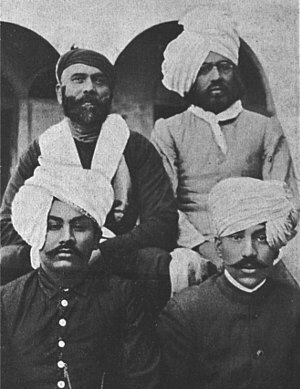 The descendants of Zakiruddin Khan and Allabande Khan adopted the name of the genre (the dagur or dagar bani of dhrupad) as their family name and acquired renown as the Dagar brothers. Dhrupad is the oldest surviving form of Indian Classical music and traces its origin to the chanting of vedic hymns and mantras. Though a highly developed classical art with a complex and elaborate grammar and aesthetics, it is also primarily a form of worship, in which offerings are made to the divine through sound or nada. Dhrupad can be seen at different levels as a meditation, a mantric recitation, a worship, a yoga or tantra based on the knowledge of the nadis and cakras and also purely as a performing art portraying a universe of human emotions. Dhrupad is a vocal tradition based on the practice of nada yoga, and is also performed on instruments like the Rudra Veena , the Sursringar. 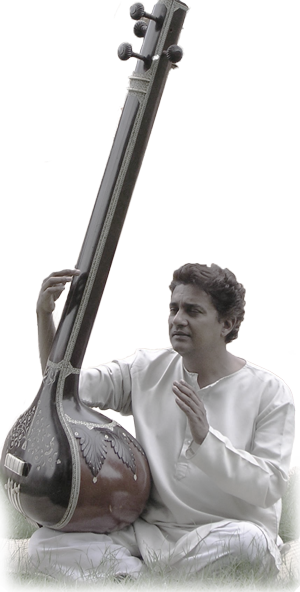 or the Rabab For the past five centuries Dhrupad has thrived primarily under the patronage of Mughal and Rajput kings. The descendants of Zakiruddin Khan and Allabande Khan adopted the name of the genre, the Dagar Bani of Dhrupad,as their family name and acquired renown as the Dagar brothers. They kept this art alive in the difficult period after 1947 when it lost the patronage of the royal courts. Zakiruddin and Allabande Khan were brothers and disciples of their grand-uncle Baba Behram Khan, and served respectively in the royal courts of Udaipur and Alwar. They were the foremost Dhrupad singers of their times (late nineteenth and early twentieth century) and were greatly respected for their singing and erudition. Their performances are still remembered with awe and reverence. Please see more details about Zakiruddin and Allabande and their descendants,today, the Dagar Brothers here. Although Dhrupad and its preceding forms originated in the chanting of vedic hymns and mantras, it gradually evolved into an independent art form with its own complex conceptual basis and grammar. Dhrupad was originally sung in temples and later thrived under the patronage of Mughal and Rajput kings. Fundamental to Dhrupad singing is the practice of Nada Yoga, in which, through various yogic practices, the singer develops the inner resonance of the body, and can make the sound resonate and flow freely through the entire region from navel to head. This enables the singer to produce a vast palette of subtle tone colours and microtonal shades. The processes of Udatta, Anudatta and Svarita play the same fundamental role in Dhrupad singing as in Vedic recitation. These processes are fundamentally linked to the ancient grama, murcchana system of tonal relations,and the Dagar tradition is probably the last that uses this ancient system based on murcchanas and not the modern thata or mela system that evolved in the last few centuries. A Dhrupad performance starts with the alap which is a slow and elaborate development of a Raga (mode) using free flowing melodic patterns. The elaboration of Dhrupad alap is done using the syllables of a mantric phrase 'om antaran twam, taran taaran twam, ananta hari narayan om'. The phrases of Dhrupad alap are very slow and contemplative in the beginning, but the tempo increases in stages, and in the faster passages playful and vigorous ornaments predominate. The audio and video samples on this site give examples of different facets of Dhrupad. Dhrupad alÄ�p is followed by the singing of a composition with rhythmic improvisation, to the accompaniment of a barrel drum called the pakhawaj (ancestor of the tabla). The Talas or cycles of beats commonly used are Cautal (12 beats), Dhamar (14 beats), Jhaptal (10beats), Sultal (10beats),Tivra (7 beats). In the videos on this page can be heard examples of Choutal and Dhamar. Dhrupad portrays a vast range of human emotions: serenity, compassion, sensuality, pathos, strangeness, anger and heroism and subtle shades of them all. In Dhrupad of the Dagar tradition the notes are not treated as fixed points, but as fluid entities with infinite microtonal shades.The music is deeply spiritual and meditative. The Dagar style of Dhrupad is defined by 52 musical concepts or Arkans (12 basic alankars and 40 more which amplify and refine them). 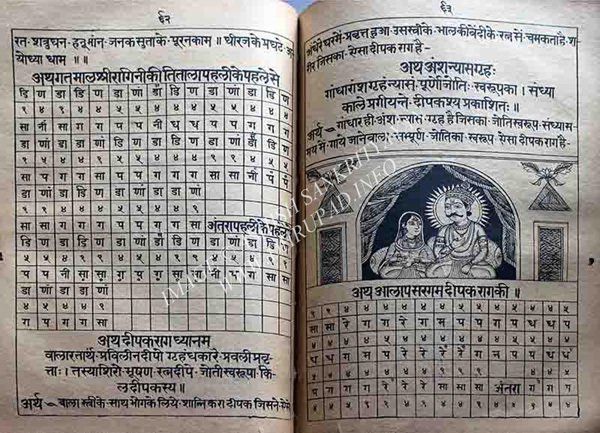 These include concepts like Udatta, Anudatta, Svarita, Sapta Gupta, Sapta Prakata, Sakari etc. which have all but disappeared from Indian classical music and even from Dhrupad . In the various audio/video files on this site can be heard all these concepts as they are used in practice in Dhrupad performance.